BU Mint Sealed 1oz Gold Buffalo Bullion Coin, 2019. The American Buffalo gold coin was the first 24 karat (99.99 fine) gold bullion coin to be issued by the United States Mint. The coin was initially released in 2006. The design of the coin is a replica of the Indian Head nickel or Buffalo nickel, which was produced by the United States Mint from 1913 to 1938. The American Buffalo gold coin was designed by James Earle Fraser. The front of the coin features the profile of an Indian Chief. The design is actually a composite of three Indian Chiefs from three different tribes. The reverse of the coin features the image of a buffalo. The Buffalo is believed to be 'Black Diamond', a famous American Bison that lived in the Central Park Zoo in New York City in the 1910s. 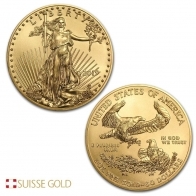 The American Buffalo gold bullion coin is available in 1 Ounce size. 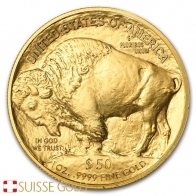 The American Buffalo is currently only available from the US Mint in gold bullion. 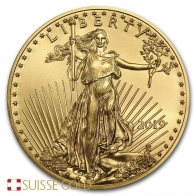 SuisseGold.ch carry the 1 Ounce gold American Buffalo coin in 2018 and backyear versions. Sold in Original Government Mint Sheets, BU condition. Please contact us to sell gold Buffalo coins.